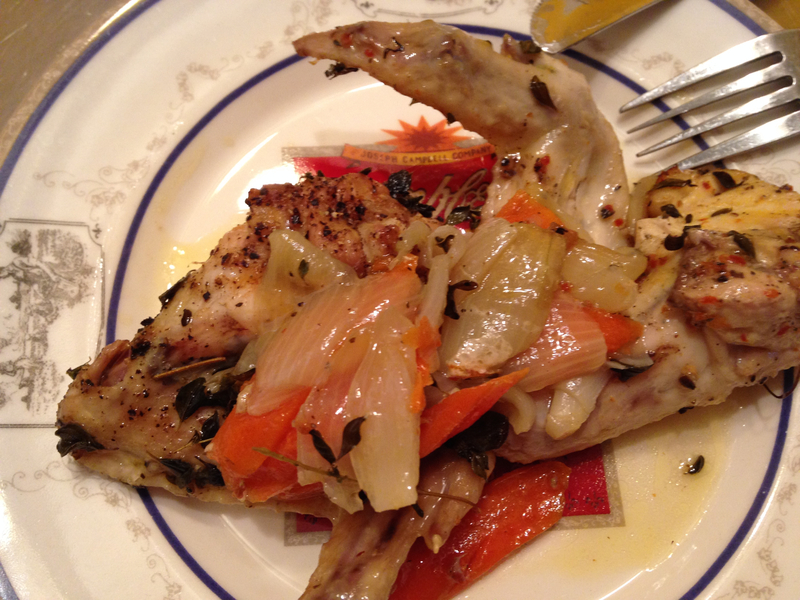 Eating roast chicken is one of those comfort yums I sometimes dream about. Awake dreaming. While driving in a car, for instance. I’m hungry. Wish I had a chicken leg. Or wing. Or thigh. I never get interested in the breast (except for chicken salad). Duane likes the chicken breast (ONLY) so it works out. I was a wing girl for most of my life. I realized the best part about wings is the equal parts meat to skin. So you get some of each in every bite. And that, of course, means FLAVOR. Then I jumped to the dark side. Thighs now being the supreme pinnacle of tastiness for chicken. And the drumstick (would love to research when we started using that term). The drumstick is best for grabbing cold leftover chicken from the fridge and chowing down immediately with hands. 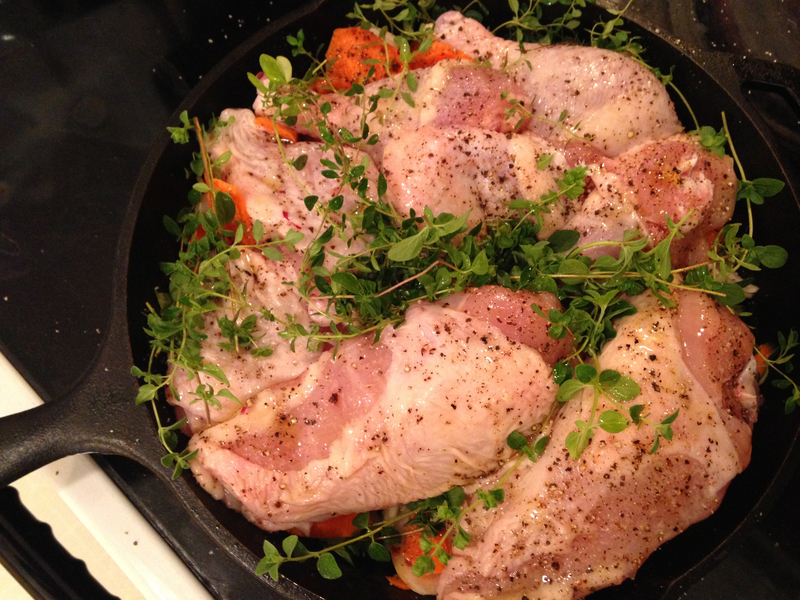 Years ago I discovered the wonders of plopping a whole chicken in a cast iron pan and roasting it. 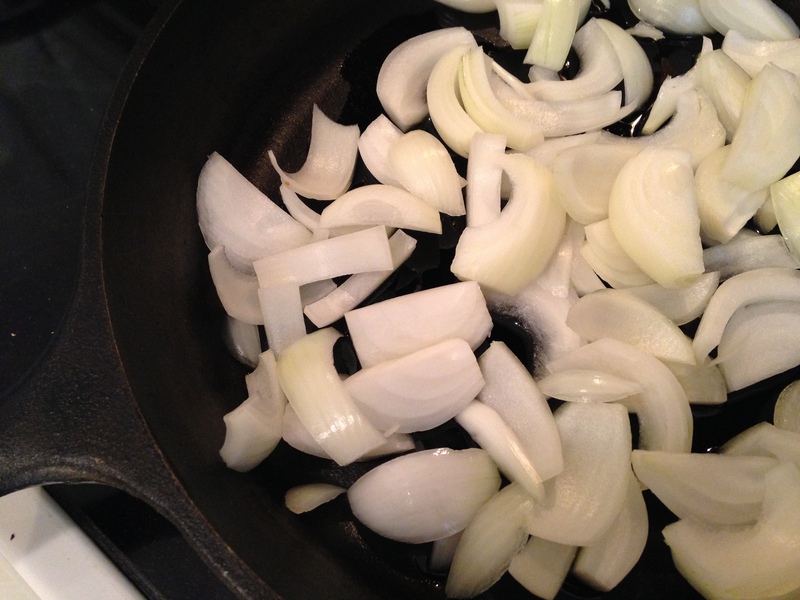 First season it with salt, pepper, a little olive oil, some aleppo, maybe a lemon juice squeeze, and then surrounding it with sliced-up onion. Perfect. (My mom adds a cup of rice around the chicken with some broth…cooked chicken-y rice is done when the roasted chicken is done…YES). 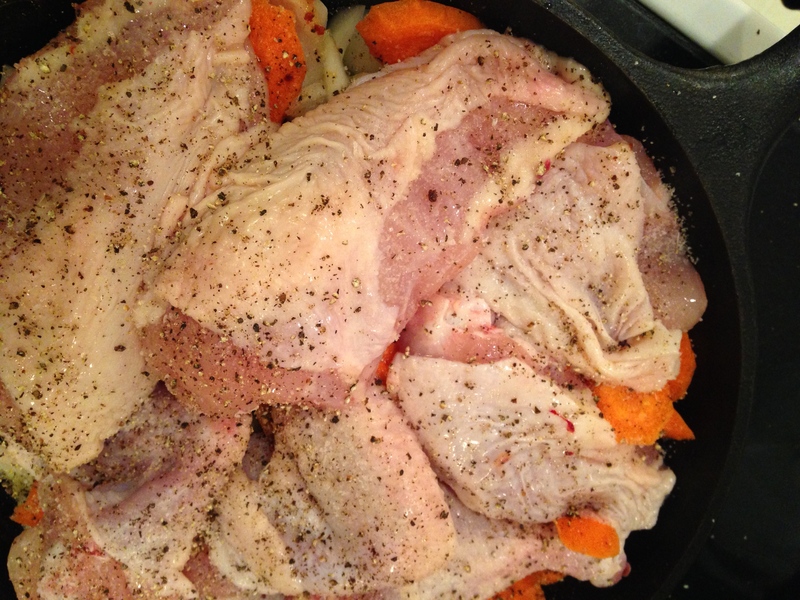 This time tho, I wanted to cut up the chicken into parts. And why not add some carrots? First I cut up 2 onions into thin wedges. Roast for about an hour in a 375-degree oven. You will have a dinner that truly comforts you. Juicy. Flavorful. Tender. The carrots and onions are slippery-succulent. 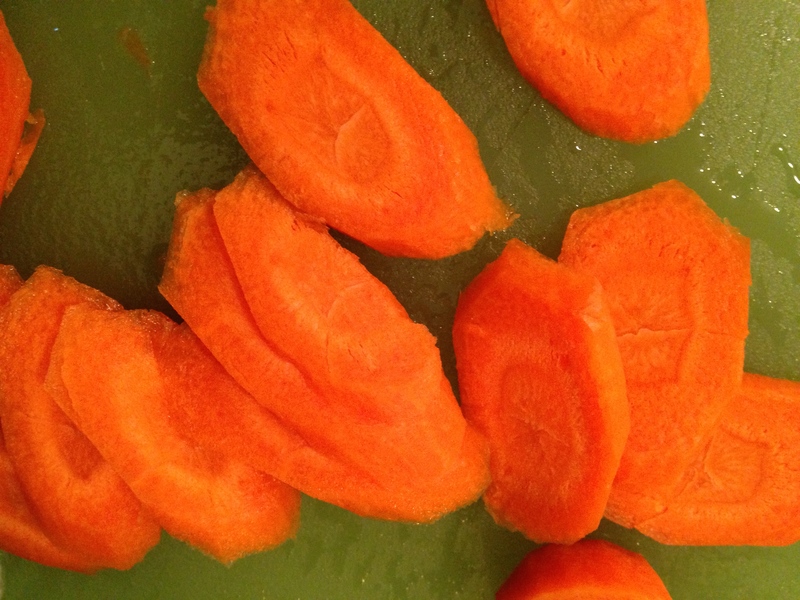 And the juices (with vegetables) must be spooned onto each serving. Here’s a couple of wings. 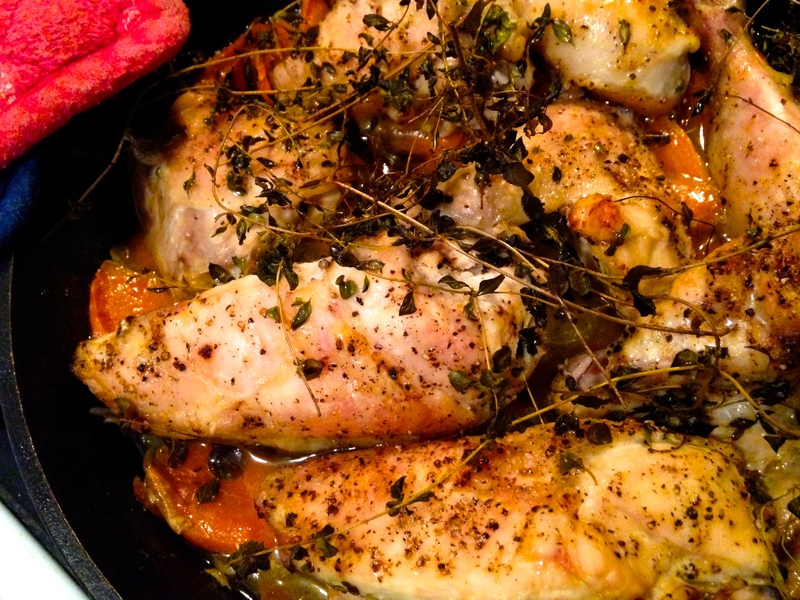 This entry was posted in recipes and tagged cast iron pan, easy chicken recipe, Roasted chicken recipe. Bookmark the permalink. Hi Janice, did you receive my fall class schedule? It went out a few weeks ago and now everything is sold out — you need to reserve ahead to take a class. Let me know if you are on my email list…if not, I will add you and the next schedule for Winter 2016 goes out in December or sooner. Thank you!